﻿ Gulf South Forest Products, Inc. » Blog Archive Gulf South Forest Products Receives Top U.S. Export Award | Gulf South Forest Products, Inc. Thanks to four straight years of export growth, Gulf South Forest Products (GSFP) was recognized at theWhite House with the government’s top export award. The Fort Lauderdale, Fla.,-based company received the President’s “E” Award for Exports from U.S. Department of Commerce Secretary John Bryson in May. This award is the highest recognition awarded to companies making a significant contribution to growing U.S. exports, which also helps grow the national economy and create jobs. 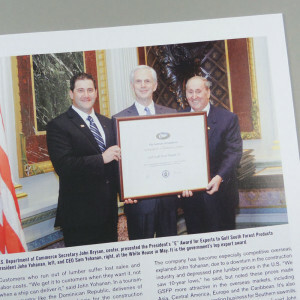 Bryson presented the award to GSFP CEO Sam Yohanan and President John Yohanan on May 17 in the Indian Treaty Room as part of World Trade Week events. Only 41 U.S. companies received the honor this year. “This administration is committed to leveling the playing field for American businesses and workers to help U.S. companies build things here and sell them around the world,” said Secretary Bryson in a press release.”‘E’ Award winners such as Gulf South Forest Products have excelled in this effort, demonstrating four years of successive export growth. It is companies like this that are helping to grow our economy and put more Americans back to work.” In 2010, President Barack Obama announced plans to double U.S. exports over the next five years. “We feel honored to be selected,” said John Yohanan. “It’s a welcome recognition for our team’s hard work over the last four years.” The U.S. Commercial Service nominates U.S. companies for “E” Awards, which are based primarily on four years of continued export growth. Recipients demonstrate a significant contribution to the country’s export expansion that is “measurable, innovative, sustainable and has broad impact.” Nominations are reviewed by the awards committee, chaired by the U.S. Department of Commerce. It includes representatives from Exim Bank, the Small Business Administration, and the Departments of Agriculture, Labor, State and Transportation. 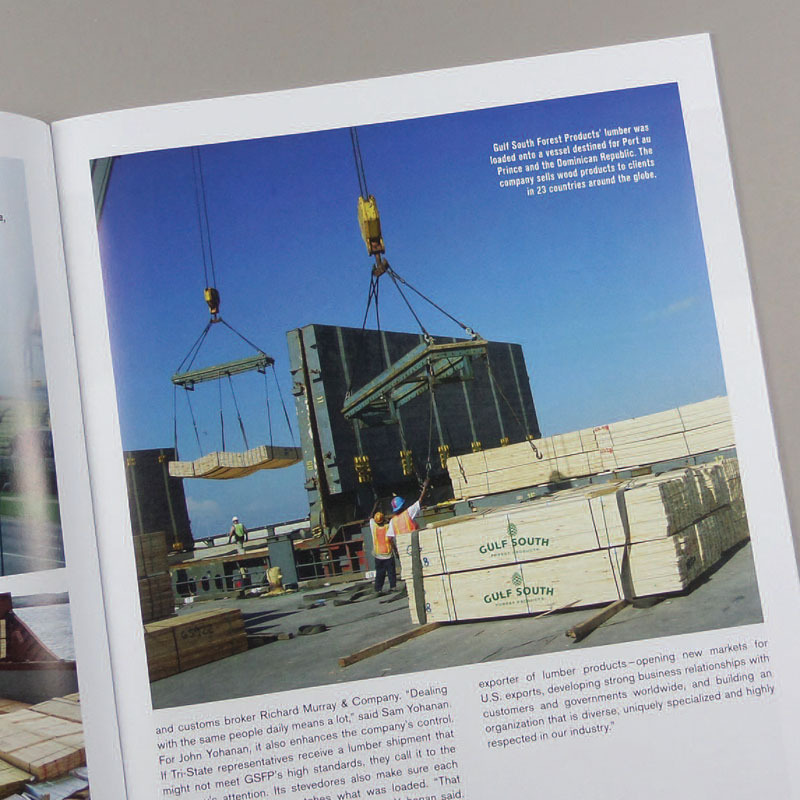 GSFP opened its doors in 1987 and sells wood products, including lumber, plywood and utility poles, to clients in Haiti, the Dominican Republic, China and 20 other countries. Approximately 95 percent of its sales are exported from the United States. The company annually ships more than 103 million board feet. “Growing our sales abroad an average of 20 percent per year for the past four years can be attributed to our expertise, service and product,” said Beverly Mullen, special projects coordinator for GSFP. The company regularly charters ships to control costs and shipping schedules. While that can be an expensive prospect, it also allows the company to meet its clients’ needs. “We’re offering a service,” explained Sam Yohanan. “That’s why we charter vessels: so we have control.” The company has become well known for its commitment to low costs and minimal delays and damages. “We take a lot of pride in that,” he said. Customers who run out of lumber suffer lost sales and labor costs. “We get it to customers when they want it, not when a ship can deliver it,” said John Yohanan. In a tourism driven country like the Dominican Republic, deliveries of forest products on a regular basis for the construction industry is vital. Diversification has also played an integral role in GSFP’s success. “Government and trade-sponsored events – they both help us in so many ways,” said John Yohanan. Involvement in government and private programs helped the company expand its business in Asia. The company continually searches out new opportunities and new markets for U.S. forest products with the U.S. Department of Commerce, the U.S. Department of Defense, the U.S. Department of Agriculture, the U.S. Commercial Service, the Foreign Agriculture Service and Exim Bank. It is also involved with the American Hardwood Export Council, the Southern Forest Product Association and the Southern Lumber Exporters Association. GSFP was recently added to the Department of Veterans Affairs’ (VA) Veterans Business Database and is eligible for Veterans First Contracting Program opportunities with the VA.
As the U.S. government recently signed free trade agreements with Korea, Colombia and Panama, Sam Yohanan hopes this will open the floodgates for more business. “We are actively pursuing Colombia and Panama; Korea is a little further down the road,” John Yohanan elaborated. GSFP has kept its eye on Cuba since 2004.When that market opens, it could be the largest market for Southern Yellow Pine in the world, said John Yohanan, explaining this was previously true in the 1950s. For the past 10 years, the Dominican Republic has been the top importer of Southern Yellow Pine. Continued growth in market share, linked to increased exports, has the potential to create jobs. After the massive earthquake that rocked Haiti in early 2010, some of the first cargo for humanitarian efforts was loaded out of the Port of Mobile on a ship chartered by GSFP. Since then, agencies worldwide have descended on Haiti to aid in the recovery, including the building of homes and hospitals for which GSFP supplies the lumber. “That will go on for the next five to 10 years at least,” said Sam Yohanan. GSFP is currently working with the U.S. government to implement a program regarding the long-term nature of construction in that country. To serve its global market, four of GSFP’s 11 employees are bilingual and two are trilingual, enabling the company to communicate easily in English, Spanish, Portuguese, Swedish, Norwegian and Mandarin. Collectively, GSFP offers 150 years of cumulative experience in the business of exporting forest products. 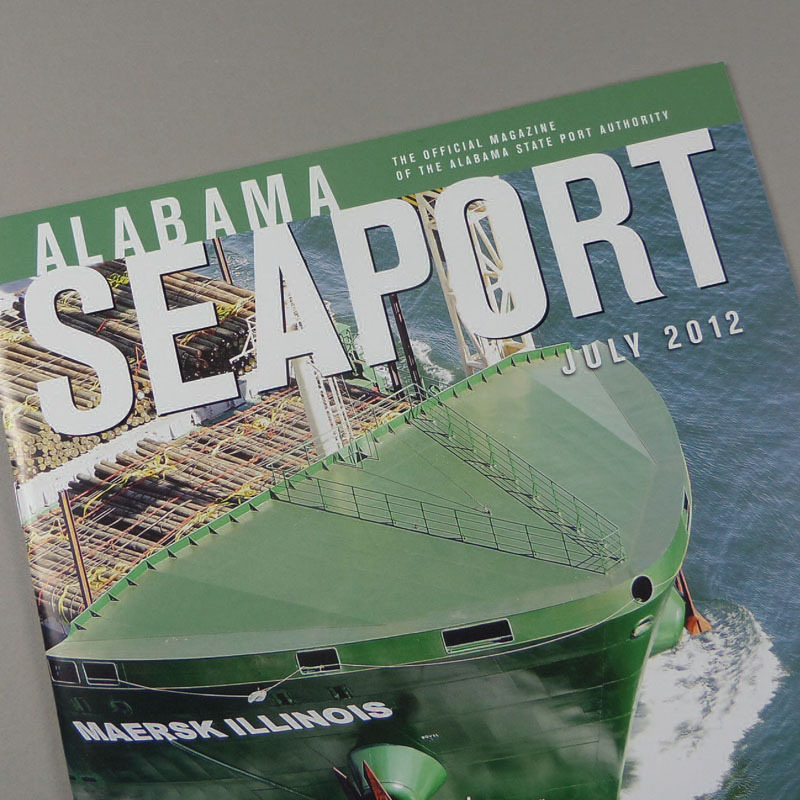 James K. Lyons, director and CEO for the Alabama State Port Authority (ASPA), applauded the U.S. Department of Commerce’s recognition of GSFP and congratulated Sam Yohanan and his team. “Our port is only as successful as our customers. Gulf South’s team of professionals work with my staff and other port service providers to deliver a level of service excellence that distinguishes them within the industry. Our board, staff and maritime community extend hearty congratulations on Gulf South’s receipt of this distinguished award,” said Lyons. GSFP has a 153,000-square-foot storage/shipping facility at the Port of Mobile’s Blakely Island Terminal, allowing it to provide hands-on service to its clients.